Sweet Corn Patties with Mozzarella Cheese. Simply Wow..!! Sweet corn is an all-time favorite, so is cheese. Combine them together in perfect crunchy still soft-centered starter recipe that is sweet corn cheese patties. Sweet Corn Patties are the most preferred starter and perfect fit for parties. Corn is ingredient that can be use in varieties of recipes like soups, main course, salads, breads, biscuits, and now even in appetizers and starters. This starter recipe is loved by kids and yeah also by all age groups. You will love the crisp, light golden appearance of this starter, which turns out so flawlessly on account of the covering of rice flour batter. It is so outwardly appealing and delicious to bite into this thing will be wiped off in the blink of an eye – intense rivalry for alternate starters you serve! 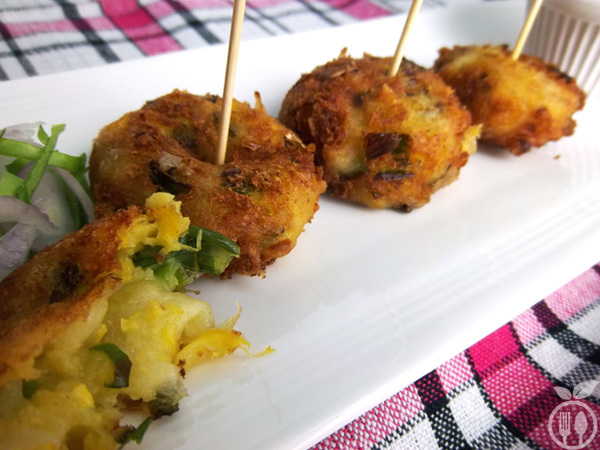 At the point when there are any specials days and occasions like birthdays, anniversaries I had couple of recipes a top priority, this is one of them in light of the fact that everyone in my family adores this sweet corn cheese balls or patties. It was a double bonanza for me to snap pictures and serve their most loved as well. What’s more, in rainy season there is dependably interest for deep-fried recipes. First time I tried this recipe when I was very young, during my high school days. It was disaster as the balls started to disintegrate when I put them into oil, few patties comes out perfect also. It had absorbed so much oil. It was mess!!! So, to recover from that disaster, I change afterwards this recipe with coating rice flour batter. So I got good result, and happy ever after, it also consumes less oil. Hence healthier also…!!! Blend the corn in a mixer to make a paste not coarse paste, just roughly blend it without using any water. Transfer mixture into bowl and all remaining ingredients capsicum, green onion, green chilli, ginger paste, salt and chat masala. Divide Mixture into 10-12 equal portions and using hand make flat base, put 1 cheese cube into it, cover cheese by whole mixture and seal it. Same way, prepare all other balls or flat ball form remaining portions. In small bowl, take rice flour and add ⅓ cup water and dilute rice flour into water and create batter. Consistency of batter is thick enough to cover ball outer layers so that balls. will not disintegrate while you are frying them. 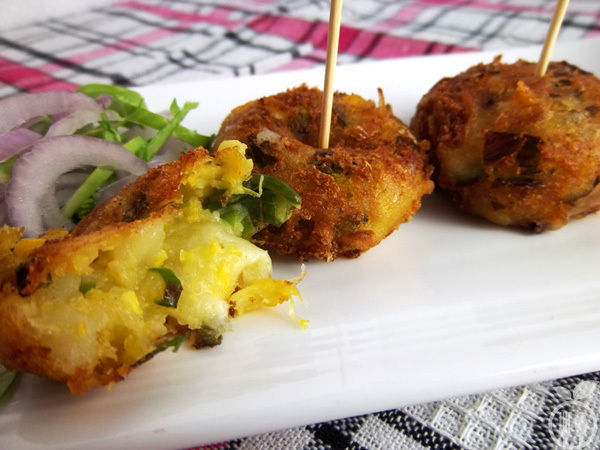 Heat the oil in a deep non-stick to fry ball, Deep corn kebab into batter and put it into frying pan. Fry it on medium heat till its color turns into golden brown. Sweet Corn Cheese patties are ready to serve; you can serve with mint-coriander chutney or also with tomato ketchup. 1) You can also shallow fry this balls. But you need to handle them gently. 2) Serving with tomato ketchup is also good option. 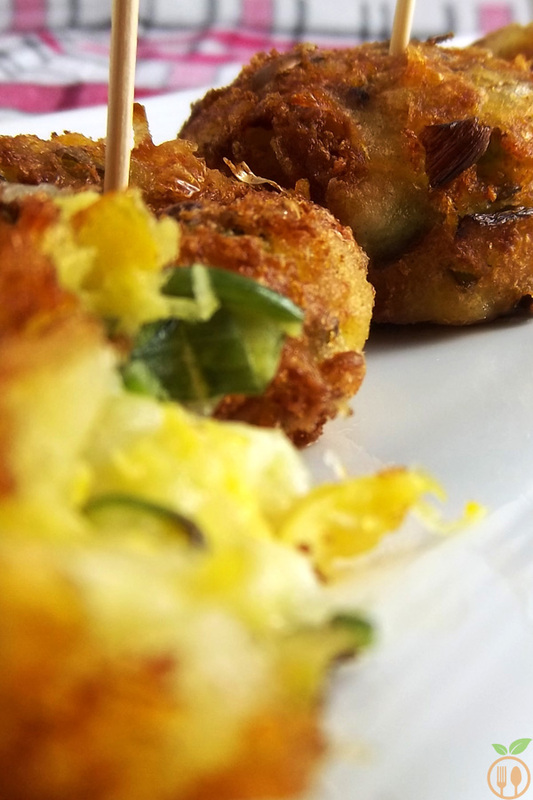 Sweet corn cheese balls are an impeccable party starter which speaks to all age bunches. Along these lines, less effort, and grate call for party dinner starter, you can likewise include this in sizzler plate…..!!!! !